Putting the tongue over the bit is a classic evasion technique in equines. When a horse's tongue is over the bit the bit is no longer effective, and the horse is able to ignore its rider's rein aids. There are many reasons horses put their tongue over the bit including discomfort and poor training. It is the horse's owner and rider's responsibility to understand the reason why horses put their tongue over the bit and the different ways to prevent this evasive behavior. Horses who put their tongues over the bit are normally expressing discomfort. 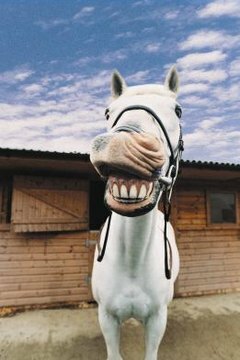 The most common reason for discomfort in a horse's mouth is sharp points on their teeth that can irritate the cheeks, gums and tongue. A horse's teeth need to be checked and floated by a veterinarian or equine dentist at least twice a year to prevent malformations and broken teeth. Bridle fit should be checked before every ride to maintain the bit's effectiveness. If a bit is too low a horse will not be able to grasp the bit properly in its mouth, and they will try to use their tongue to stabilize the bit. A good test of bridle fit is to see if there are two soft wrinkles appearing at the corners of your horse's lips. If there is less than two wrinkles than the bit is probably too low. Some horses dislike the pressure a bit applies to their tongue. With these types of horses, a ported bit may stop the evasive behavior. The width of your horse's tongue and shape of its palate also factor into your choice of bitting for your horse. If your horse has a large tongue that escapes the edges of its teeth, there will be little room for a bit, and you will need a thin mouthpiece. A flat palate, the roof of the horse's mouth, also indicates that there is less room for a bit and that your horse may prefer a french linked bit. Due to poor training some horses may never be able to be ridden comfortably with a bit. Scar tissue on the tongue and lips is extremely painful, and pressure on it should be avoided. Hackamores, side-pulls and bitless bridles are a good alternative in this situation because they put pressure on the nose, chin and poll instead of the mouth and tongue. Once a horse has developed a pattern of putting its tongu over the bit, it can be difficult to break the habit because the behavior is addictive. When a horse places the bit under its tongue, he receives an endorphin release much like a smoker with cigarettes. Some horses develop this habit because they are nervous about being ridden. This could stem from a history of abuse or the lack of mental maturity required to be ridden. You should seek advice from an equine professional if you cannot prevent this behavior in your horse by changing your horse's bit or floating its teeth.